Published by W.D. Hoard & Sons Co.
See for yourself. Start by talking to your local Mycogen dealer or sales rep. Researchers and plant breeders attempt to stay ahead of the seedling disease curve. A lifelong investment in agriculture’s future Ed Ballard has written a resume that few can match. Taking corn silage to new heights Corn silage cutting height impacts forage quality and yield. Scientists work to turn data into information. HAY & FORAGE GROWER (ISSN 0891-5946) copyright © 2016 W. D. Hoard & Sons Company. All rights reserved. Published six times annually in January, February, March, April/May, August/September and November by W. D. Hoard & Sons Co., 28 Milwaukee Ave., W., Fort Atkinson, Wisconsin 53538 USA. Tel: 920-563-5551. Fax: 920-563-7298. Email: info@hayandforage.com. Website: www.hayandforage. com. Periodicals Postage paid at Fort Atkinson, Wis., and additional mail offices. SUBSCRIPTION RATES: Free and controlled circulation to qualified subscribers. 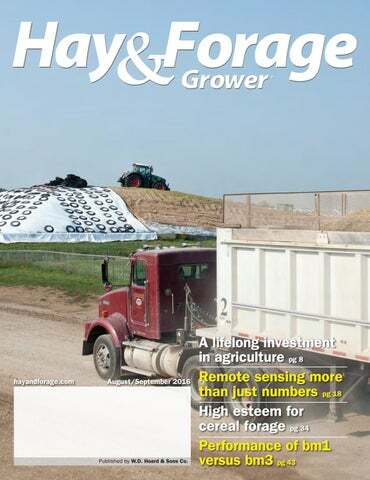 Non-qualified subscribers may subscribe at: USA: 1 year $20 U.S.; Outside USA: Canada & Mexico, 1 year $80 U.S.; All other countries, 1 year $120 U.S. For Subscriber Services contact: Hay & Forage Grower, PO Box 801, Fort Atkinson, WI 53538 USA; call: 920-563-5551, email: info@hayandforage.com or visit: www.hayandforage.com. POSTMASTER: Send address changes to HAY & FORAGE GROWER, 28 Milwaukee Ave., W., Fort Atkinson, Wisconsin 53538 USA. Subscribers who have provided a valid email address may receive the Hay & Forage Grower email newsletter eHay Weekly. harvester? There is not an extensive body of research to definitively answer these questions. There are, however, some passionate opinions on the topic. Those university specialists who have written on both sides of the issue have gotten beat up by the opposition. The same wrath has been poured on some media outlets that have printed the specialists’ releases and comments. I’m sure a similar fate has befallen others in the industry, consultants or forage harvesters, who have also been publicly vocal. That’s really too bad because open discussion is all a part of the process. It’s also understandable that when money, and lots of it, is on the line, passions run high. Even so, it’s possible to have constructive debate without being nasty. What is known for sure is that time usually answers all questions. There will be more research, more experience, more engineering, and more emphasis on achieving a 70-plus kernel processing score (KPS) regardless of make and model. In the interim, there’s no doubt that the debate will rage on. Sorting out alfalfa seedling diseases that are active in wet soils has proven to be a challenge, but progress is being made. ditions and were found to have rotted lateral roots, lack root nodules, and have stunted and yellow foliage. The culprit identified To determine what was causing the disease symptoms, researchers needed to obtain the pathogen in a pure culture. Attempts to isolate the pathogen from pieces of rotted root tissue were unsuccessful due to the large number of other organisms that colonized the dead roots. Another technique was developed using soil sampled from fields with the disease to grow alfalfa seedlings as “bait.” The pathogen was isolated from seedlings in which the disease was just beginning and was grown successfully on laboratory media. Another oomycete, called Aphanomyces euteiches, was found to be the organism causing this root rot. Using the isolated pathogen to artificially inoculate alfalfa seedlings, researchers at the University of Wisconsin identified resistant plants from a number of alfalfa cultivars. Resistant plants from these tests and healthy plants selected under field conditions were intercrossed to create the first alfalfa lines with Aphanomyces root rot resistance called WAPH-1. The first resistant cultivars were commercially available in the 1990s, and field tests showed that the new cultivars provided dramatically improved seedling health, yield, and persistence. While P. medicaginis is relatively specific to alfalfa, A. euteiches causes serious disease in pea, bean, and red clover as well as alfalfa. The pathogen is composed of a complex of genetically diverse subspecific types. One level of complexity is for host preference. For example, most strains isolated from pea will infect alfalfa but cause more serious symptoms on pea. Some strains isolated from alfalfa will infect pea, but others will not. The second level of complexity is based on race within the alfalfa-infecting types. Resistance sometimes failed Distinct races of A. euteiches were identified that infect alfalfa after the release of Aphanomyces root rot resistant cultivars. Not long after the widespread use of these cultivars, there were reports of failures in disease resistance. Aphanomyces root rot was occurring even though plants had been bred for high levels of resistance. Using the alfalfa seedling baiting technique, researchers DEBORAH SAMAC The author is with USDA-ARS Plant Science Research Unit, St. Paul, Minn.
isolated strains of A. euteiches from field soils that had shown failure of resistant cultivars and used them to inoculate alfalfa seedlings. The new isolates did indeed cause root rot disease on cultivars previously thought to be resistant. New programs of selection at the University of Wisconsin were initiated to identify alfalfa plants with resistance to both types of A. euteiches. These efforts resulted in development of an alfalfa line with resistance to both types called WAPH-5. With two kinds of resistant alfalfa lines, races of the pathogen could be identified. Those that caused disease on Agate but not on WAPH-1 were called race 1, while those that caused disease on WAPH-1 but not on WAPH-5 were called race 2. Commercial alfalfa breeding companies began to develop cultivars with resistance to both race 1 and race 2. Tests with individual soil samples found that race 2 occurs in many areas of the United States. However, it was not clear if it was a major or minor component of the pathogen complex. Starting about 10 years ago, intensive surveys were done in Wisconsin, Minnesota, and New York to determine the distribution of race 1 and race 2 strains. Soil samples were obtained from commercial production fields and used in a bioassay with alfalfa lines susceptible to both Phytophthora and Aphanomyces root rot, “Agate” with Phytophthora root rot resistance, WAPH-1, and WAPH-5. In the three states, it appears that race 2 strains are more common than race 1 strains. That is, the WAPH-5 seedlings were healthy, while the WAPH-1 seedlings were killed. However, there were also a number of “anomalous” soils in which a clear result could not be obtained, suggesting the possibility of additional races. More disturbing were some reports of failures of race 2 resistant varieties in some locations. Pythium and Fusarium strains cause pre- and postemergence damping off and seed rot of alfalfa (right) compared to soil lacking the pathogens (left). Percentage of Aphanomyces euteiches races in Minnesota soils. Race 2 is more common than race 1 in the 44 soils assayed from commercial production fields. Low risk of Aphanomyces indicates that neither race was observed at a damaging level. Approximately 7 percent of the soils had high levels of Pythium and Fusarium, causing damping off. Root rot occurred in approximately 16 percent of the soils, but the pathogen could not be identified. Ed Ballard has been managing the Dudley Smith Farm since its establishment in 1995.
egy. He believes that corn and cattle need to supplement each other. “Our goal is to improve soil and attain yearround forage production,” Ballard said. SYDNEY SLEEP The author is the Hay & Forage Grower editorial intern and a student at South Dakota State University. QUALITY. OTHERS CLAIM IT. WE HAVE IT. Committed to innovation, we continuously invest in the latest polymer research and development, ensuring our netwrap and twines are the industryâ&#x20AC;&#x2122;s best. Engineered and manufactured for increased strength and resilience, our products lead the way with unrivaled quality that saves you time, money and a whole lotta trouble. Bale with the best. Bale with Bridon Cordage. Every baling season, Bridon Cordage has your back. We offer premium netwrap and baler twines for any application. Pastures contain 30 percent clover to maintain at least 20 percent crude protein and TDN values in the 60s to low 70s. Forage dry matter yield consistently averages 5 to 6 tons per acre. at pasture versus cropland in nutrient management runoff,” Ballard said. There is a diverse combination of soils on the farm with no more than 5 to 10 percent of one type. “This makes it challenging because there are totally different management types with the soils,” Ballard said. Since the farm was established, no commercial fertilizer has been used on the pastures. “We test our theories here, and if they work, we can take them to the university, and there they can be researched on a bigger scale at a larger site,” Ballard explained. Some other projects that have been conducted at the farm include studies of continuous and strip grazing of corn residues, effects of summer supplement feeding frequency, and minimizing fescue toxicosis by grazing novel endophyte-infected tall fescue following grazing endophyte-infected tall fescue. THE ULTIMATE SILAGE PROTECTION SYSTEM SILOSTOP specializes in silage protection systems. We help farmers and producers around the world make the best possible silage. Willie Foster checks hay moisture as he prepares for another day of wrapping bales. HarvXtra™ alfalfa is the most advanced alfalfa trait in the industry. A wider cutting window gives farmers the flexibility to maintain a normal harvest schedule and achieve higher quality. Or, delay harvest for up to 7 days for higher yield potential without sacrificing quality, when compared to conventional alfalfa at the same stage of maturity. HarvXtra™ alfalfa also comes stacked with Roundup Ready® Technology for unsurpassed weed control. For the 2016 growing season, HarvXtra™ Alfalfa with Roundup Ready® Technology is available for planting in a limited geography and growers must direct any product produced from HarvXtra Alfalfa™ with Roundup Ready® Technology seed or crops (including hay and hay products) only to US domestic use. It is a violation of national and international law to move material containing biotech traits across boundaries into nations where import is not permitted. Growers should talk to their product purchaser to confirm their buying position for this product. ALWAYS READ AND FOLLOW PESTICIDE LABEL DIRECTIONS. Roundup Ready® crops contain genes that confer tolerance to glyphosate, the active ingredient in Roundup® brand agricultural herbicides. Roundup® brand agricultural herbicides will kill crops that are not tolerant to glyphosate. Roundup Ready® and Roundup® are trademarks of Monsanto Technology LLC, used under license by Forage Genetics International, LLC. HarvXtra™ is a trademark of Forage Genetics International, LLC. HarvXtra™ Alfalfa with Roundup Ready® Technology is enabled with Technology from The Samuel Roberts Noble Foundation, Inc.
University of Missouri Extension forage specialist. His work and interest in fescue toxicosis has him involved in a genetic test for tolerance in cattle. HFG: Working in the heart of the Fescue Belt, you see or hear about the effects of fescue toxicosis on a daily basis. Just what kind of impact are we looking at from an economic and animal performance perspective? CR: Even putting aside the herd health issues (vasoconstriction, thermoregulation, immunosuppression), toxic fescue is devastating to beef production. It reduces calving rate, shrinks intake and gain, lowers weaning weight, and drops milk production. The impact is severe. For example, on a “straight grass” comparison, rate of gain can drop from 1.7 pounds per day (on nontoxic grass) to 1 pound per day (on toxic fescue); that is typical. Milk production can decline by 30 percent. Calving rate (in spring-calving herds) can fall from 95 percent to 58 percent. and how it was developed. Our company is advised to not discuss development but to focus on the confirmation data. I would say, however, that I have seen how difficult it was to develop this test. HFG: When was it realized that some cattle were more tolerant of fescue toxicosis than others? CR: Many farmers and scientists have observed differences within cow herds for many years. Unfortunately, their observations were sometimes ignored because their remarks were often exaggerated. Many claimed that their cattle were completely resistant to toxic fescue. No cattle are completely resistant, and follow-up research proved that. HFG: If a beef producer wants to test cattle for fescue tolerance, what is the protocol? How much does it cost? CR: The protocol is laid out in five steps: 1. Obtain sampling cards. 2. Print a sampling form (from www.agbotanica. com). 3. Collect the blood or hair sample. 4. Submit payment. 5. Mail the sample to AgBotanica in Columbia, Mo. The turnaround time is four to six weeks. HFG: What procedure was used for documenting the accuracy of the test? CR: There are several ways to confirm the accuracy of T-Snip, as this test scores for performance based on average daily gain, dry matter intake, weaning weight, and soon other measures of performance. The easiest confirmations occurred by comparing T-Snip test scores to 205-day adjusted weaning weights. When the test was launched, it had been tested on almost 3,000 cow-calf observations, on eight farms, many of which were tested over two and three years. In each issue of Hay & Forage Grower, we talk to a forage industry newsmaker to get their answers on a variety of topics. nonfescue areas might also be interested in if they are selling stockers into the Fescue Belt? CR: Absolutely. We are already seeing that. Some producers outside of the Fescue Belt refer to their cattle as “fescue ready” when those animals score high on this test. Also, producers with novel endophytes should consider themselves as being in a nonfescue area. Again, those animals are excellent. But they are naïve to toxic fescue. HFG: Where do you see the future headed with the incorporation of fescue toxicosis tolerance into the genetic pool? CR: Testing for fescue tolerance will be one more technology used in genetic analysis of cattle and likely will be added to genetic test platforms available to cattle producers. Based on performance potential benefit, a cow-calf producer with cattle in the Fescue Belt should use bulls tested to be tolerant to toxic fescue and use fescue tolerance testing as one (not the only) of the selection criteria for identifying replacement females. Therefore, it is expected that performance data on sires will include a T-Snip score. HFG: Favorite food? CR: Fried shrimp . . . from the gulf! • Portions of this interview describe T-Snip testing. T-Snip is not affiliated with the University of Missouri but is a commercialized technology from the start-up company, AgBotanica LLC, in which Roberts has a financial interest. The Ag-Bag system creates and preserves high quality silage in an air-tight, oxygen-free environment, greatly minimizing storage losses. Discover the economic advantages of using the Ag-Bag system to retain high feed value and significantly reduce expenses. bale all day.” “When you count the tractor pulling the baler, the entire system covers about 90 feet,” added Steve Maddox, father to Steven. the pickup head, to the wind guard (above the pickup head), the packing chamber, and the packing chamber floor. A 300-gallon diesel tank fuels the hay steaming system. Since making the switch, Riverdale, Calif., dairy farmers have noticed a significant reduction in supplemental protein needs for the milk cow ration. “Our alfalfa hay bales weigh 100 pounds more because we are keeping so many more leaves,” Steven said when describing the farm’s large square bales, which are routinely weighed across the farm’s scale. University studies back up Maddox’s observations as leaf loss generally gets cut in half. As for speed of baling, that generally picks up because more hay is getting packed into each bale. It takes a 170 to 180 horsepower (HP) tractor to pull the entire rig on flat ground. That HP goes up to 200 to 250 when baling on hillier fields. The steamer is commercially produced by Staheli West, which is based out of Cedar City, Utah, in the southwest part of the state. There is one drawback to using the steamer as part of the cropping enterprise. “We cannot use the steamer when temperatures are over 95°F,” said Steven, because the water doesn’t vaporize as well. COREY GEIGER The author is managing editor of Hoard’s Dairyman. OR the past several years, The Samuel Roberts Noble Foundation Forage Improvement Divisionâ&#x20AC;&#x2122;s agronomy lab has been studying remote sensing as a way to estimate forage amount and protein content using real-time or short-delay data. Although we work in an applied research environment, our strategy is producer-focused. We are working to develop components that could become helpful management tools for producers to use when making forage estimates and stocking rate decisions. After about five years of study, we have developed a combination of technologies that the Noble Foundation currently uses as a forage biomass and crude protein estimation tool. such as fertilizer and herbicides, by more efficiently using resources. implications. These modeled estimates could range as simple as the forage amount, where the manager makes the call on how to allocate the resource, to as complex as offering trend information on how holding or selling according to the current market, climate, forage species, and forage load could influence the bottom line for the production cycle. This leads to the next level in data to be turned into information. Unmanned aerial vehicles (UAVs) hold the potential to collect much larger amounts of data more quickly and deliver more comprehensive information. One key difference with the UAV will be the use of light detection and ranging (LIDAR) lasers to essentially draw a point-bypoint picture of a management area and evaluate it as a whole or in pieces. The data collected from LIDAR is called a point cloud, which has a much greater resolution than the systems currently used at the Noble Foundation. The functional difference is somewhat similar to the difference between an old-fashioned tube TV and a new generation 1080p HD smart TV. Although both can deliver a discernible picture, the newer generation TV is much more detailed and delivers higher resolution visualized information. sensors. When the user decides enough information has been entered or all the available information has been collected, regardless of how sparse or extensive it may be, the visualization and table information could be turned into a report. From these two pieces of information, a manager could visually realize how resources are oriented in an area, as well as what the quantitative numbers actually are and what possibilities or limitations the future may hold. Remote sensing has the capability to provide information such as forage biomass estimates that can be used to guide daily decisions. F YOU ask most dairymen what their biggest fear was when they made the switch to a custom harvester, the answer is usually if the cutter will show up on time. After a few years of getting to know the cutter, or maybe switching to a different custom harvester because of a previous late arrival problem, the biggest fear remains, “Will the chopper roll in the drive when I need it here?” From a cutter’s perspective, there are only a limited amount of days to make a year’s worth of payments. We obviously want to cut silage as many of those days as possible. From the dairyman’s point of view, it would be great if the chopper and trucks were sitting in his driveway a week before the crop was ready. The reality exists someplace in the middle. How can both parties be happy the majority of the time? This is where the six P’s come into play: Prior Proper Planning Prevents Poor Performance. The Prior part begins in the winter when you talk about how the previous season went. If this is a new customer-cutter relationship, make it a couple of hour-long meetings. These Proper Planning meetings involve talking about hybrids, planting dates, field locations, ordinary harvest window weather, field conditions, expectations, goals, and a very long list of details and logistics are what will help Prevent Poor Performance. Visiting field locations, examining road conditions, meeting the growers, talking with the nutritionist, and receiving monthly updates on how the crop is growing are all part of the lead up to harvest. searching the internet to get an average rainfall amount for the location and month you are harvesting. How about only counting on being able to harvest seven out of 10 days? If the harvester’s schedule is to be cutting 100 percent of the time, I can say with absolute certainty they are going to be late to arrive at some of their customers. Is the harvester actively looking for more work in the same harvest window as you, or are they willing to focus on you and their existing customers? Timing is everything We all know the “go and blow” cutter. This is the cutter that puts acreage and tonnage ahead of quality or service. You will find this type of cutter is most often driven to be this way because they are hanging on by a financial thread. If, as a dairyman, you are comfortable with the amount of risk associated with not knowing when or who is going to be harvesting your crop, then by all means look for this type of operator; they are also usually one of the cheaper cost alternatives available and these cutters are almost always looking for more work because of lost customers. When milk prices were high, it might have made sense to offer a bit of a bonus to your cutter to help make sure they were at your farm when needed. With today’s dairy climate, that may not be real practical. But on the flip side, we all know one of the quickest ways to lose money is with poor-quality forage. Cheaper is definitely not always better. A quality-minded cutter will usually know their costs and will set their price so that they can be profitable. A longterm relationship with a cutter allows you to work together through market swings, both down and up. Lost a great one As I am writing this, many people are making their way to a suburb of Atlanta to pay tribute to yet another great man who was lost too early in life. I got to know Kevin Bien in 1997 when we first started looking at Fendt tractors. Kevin’s passion for “his” tractor line was something I had not witnessed before. As time went on, he became much more of a friend than a corporate guy for Agco. You could always count on a good story, a pat on the back, a lesson on the important things in life like “faith, family, friends,” and a real good laugh. I was lucky enough to help induct Kevin into The U.S. Custom Harvesters Hall of Fame this past January. Over the last month and a half, I had been getting updates on his battle with a pretty vicious brain cancer. On June 2, Kevin lost the battle. Rest in peace, my friend. • JON ORR The author is a partner in Orrson Custom Farming Ltd., Apple Creek, Ohio. He serves as advisor on the U.S. Custom Harvesters Inc. board. Get the right boron for the job. Reach for Wolf Trax Boron DDP®, the nutrient tool that is field-proven to perform by top alfalfa producers like you. With our patented EvenCoat™ Technology, Boron DDP coats onto your dry fertilizer blends. The result is crop-safe, blanket-like distribution of boron across the field. With many more points of interception for your alfalfa crop, Boron DDP supports vigorous, healthy regrowth after each big cut. See how the right nutrient tool can boost production in your alfalfa fields. Ask your fertilizer dealer for a blend that includes Wolf Trax Boron DDP. wolftrax.com Copyright © 2016, All Rights Reserved - Compass Minerals Manitoba Inc. Wolf Trax and Design, DDP, EvenCoat are trademarks of Compass Minerals Manitoba Inc. Compass Minerals is the proud supplier of Wolf Trax Innovative Nutrients. Not all products are registered in all areas. Contact wolftrax@compassminerals.com for more information. Product depicted is Wolf Trax Iron DDP coated onto urea fertilizer. Other DDP Nutrients may not appear exactly as shown. Birdsfoot trefoil matched grain-fed beef in consumer overall liking. University, forages were explored that provided a range in dietary carbohydrate. Three groups of cattle were provided different finishing diets during the last four months of production up until harvest. The first group was provided a typical feedlot ration (USUGrain), the second grazed the legume birdsfoot trefoil (USUBFT), and the third grazed meadow bromegrass (USUGrass). Feed dietary composition and carcass composition of the university cattle were evaluated. Additionally, ribeye rolls were retained for meat quality evaluations. To understand how the university-produced cattle would compare with retail beef, USDA Certified Organic Grass-fed (OrgGrass) ribeye rolls and feedlot-finished USDA Choice (ChGrain) ribeye rolls were purchased. Ribeye steaks were produced and evaluated by consumers for sensory properties, total fat content, and fatty acid content. cators of carcass fatness (fat thickness; kidney, pelvic, and heart fat) revealed that diet did have an impact on carcass fatness in this study with USUGrain and USUBFT being comparably greater than USUGrass. Among ribeye steaks, fat content was greater for grain-finished (ChGrain) than all grass-finished beef and USUGrain (Figure 1). Among the USU-finished beef treatments, the fat content of USUBFT was intermediate to USUGrain and USUGrass. The elevated fat content concentration of birdsfoot trefoil-finished beef is of interest due to the well documented impact of fat content on palatability. Consumer liking When ribeye steaks were evaluated by consumers, USUBFT was determined to have comparable tenderness, juiciness, and overall liking with grain-finished beef. Meanwhile, each of the grass-finished beef (USUGrass and OrgGrass) were determined to be liked less by consumers for all attributes in comparison with grain-finished beef. Among attributes, flavor liking was the only attribute where USUBFT was not at least comparable with grain-finished beef. This result is of interest due to the well documented impact of forage finishing on flavor-contributing fatty acids. Considering the impact of diet on both fat content and beef palatability, there were specific links with beef fatty acid content. As previously described, changes in marbling content occur primarily through higher amounts of triglycerides during animal finishing. Furthermore, there is a propensity for greater accumulation of SFA and MUFA within beef triglycerides as overall marbling JERRAD LEGAKO The author is assistant professor in the nutrition, dietetics, and food sciences department at Utah State University. *Conventional feedlot (USUGrain), perennial legume, birdsfoot trefoil (Lotus corniculatus; USUBFT), and meadow brome (Bromus riparius Rehmann, USUGrass). Figure 3: Influence of dietary treatments on beef ribeye monounsaturated fatty acid content. The author wishes to acknowledge the contributions of Jennifer MacAdam and Silvana Martini, Utah State University, in conducting this research. Figure 4: Influence of dietary treatments on beef ribeye Omega-6:Omega-3 fatty acid ratio. by Adam Verner plugs. The ideal alignment occurs when the crop hits the lower third of the top roll. This ensures continuous crop flow and is crucial to the differential speed of the rolls as well. Many KPs run at a 30 percent differential speed, meaning that the top roll is turning 30 percent faster than the bottom roll. This leads to the tearing and slicing of the leaves, cob, and kernels. Changing your differential speed may change the way you chop and process your corn this year. S SUMMERTIME comes to a close, there is usually a different buzz on the radio. I’m not talking about on your Sirius or FM dial. I’m talking about all of the chatter that will be on the CB radios for the next few months during harvest season. For most livestock and dairy producers, corn silage harvest can be considered the single most important time of the year. Whether you use a custom harvester or your own chopper, making sure your corn silage gets put up at the right stage of maturity and moisture and is processed correctly are very important. Putting up a mediocre crop of corn silage could be the difference in purchasing thousands of dollars of unnecessary supplemental feed or having less milk in the tank. One part of this silage process has taken years to become relevant — kernel processing. Most people are now aware of the Corn Silage Processing Score (KP score). The KP score is basically how well the corn silage, mainly the corn kernel, is processed during chopping. The more processing, tearing, and pulverizing of the kernel you can get the better. This is why the setup of your forage harvester and its kernel processor can be the difference in great silage and average silage. The optimal KP score is 70 or above. An adequate score is from 50 to 70, and below 50 would be considered poor kernel processing. Most of the new choppers purchased today can be properly set up and adjusted to achieve the optimal 70-plus KP score. I have made a checklist of the places to check on your forage harvester to ensure you are doing everything you can to produce excellent processed corn silage. The KP gap spacing is also critical. The gap distance is going to vary by machine, brand of rolls, hybrid, and the silage end user. Some operators run their KP gaps as close as they can, 0.5 millimeters (mm), while others are over 3 mm. This is where it will take time and testing to figure out what gap spacing you should be running in each field and for a particular hybrid. Do not be afraid to stop the cutter, exit the cab, and check what is coming out of the spout. You should not find any whole kernels in a 32-ounce cup sample of fresh silage. If you are finding several whole kernels, then you probably need to look at tightening up the KP. Before the season, also check the calibration of the KP gap to make sure what the monitor in the cab reads is the same gap the KP is set to. I also recommend at least once per week or every knife change to inspect the KP rolls for any damage or excessive wear. You can have everything set and adjusted perfect, but if the rolls are worn out, you will not do a good job of processing. This may seem like a lot, but a few hours spent properly adjusting your cutter can lead to higher feed quality in the pile and a lower cost of the feed in the feedbunk. So, before you go out and spend tens of thousands of dollars on new KP rolls this season, stop and check to make sure that your cutter is properly adjusted first. You just may be surprised as to what your current chopper and rolls are capable of! Be safe this harvest season! • ADAM VERNER The author is a managing partner in Elite Ag, LLC, Leesburg, Ga. He also is active in the family farm in Rutledge. by Gonzalo Ferreira On an as-fed basis, the sorghum silage is 15 percent cheaper than the corn silage, which is great. On a DM basis, the sorghum silage is still 12 percent cheaper than the corn silage, which is still great. However, if we formulate least-cost diets, feeding lactating cows can be 4 percent cheaper when including corn silage than when including the lower cost sorghum silage. This is explained by the greater need for more expensive concentrates to obtain similar rations. using corn silage will likely allow for less concentrate in the diet. Remember the big picture Similar to building a puzzle, when evaluating your feeding program it is important to analyze the small pieces while always keeping an eye on the whole picture. This is especially important during major decision-making times, such as defining which forages to grow. For instance, planting corn for silage will likely require higher seed costs per acre than any other forage. Paying for corn seed involves writing and signing a tangible, high-value check. Does this large amount imply that managers are obligated to find alternative and cheaper forages? Maybe yes, and maybe no. First of all, seed costs are only a portion of the total costs of the silage. On top of seed costs are fertilizer, chemical, chopping, and ensiling costs that dilute the seed cost difference between alternative forages. As mentioned before, another piece of the whole puzzle is the amount of concentrate needed to formulate diets. Let’s now consider $45-per-ton corn silage with 31 percent dry matter (DM), 4.2 percent ash, 8.4 percent crude protein (CP), 42 percent NDF, and a 34 percent starch concentration. Compare this corn silage to a $38-per-ton forage sorghum silage with 30 percent DM, 7.9 percent ash, 7.1 percent CP, 56 percent NDF, and 18 percent starch concentrations. Logistically and financially, needing more concentrates is not a minor detail, especially when prices of commodities are very high. For our example, concentrate needs would be 21.6 pounds per cow when including corn silage and 27.4 pounds per cow when including sorghum silage in the diet. This difference translates into 27 percent more purchases of concentrates, which may put more stress on the financial budget. An analogy might be made with the “short blanket syndrome” (either your feet or your shoulders are cold). What is saved from one side (silage costs) can be lost from the other (concentrate costs). If this analysis is valid, then why is it so hard to make certain decisions? The answer may be related to what we see and what we do not see. Or alternatively, to what hurts and what seems to not hurt. Paying an extra 15 percent difference (or more) all at once seems to hurt more than losing a 27 percent difference in small chunks. In conclusion, a holistic vision is needed to ensure adequate decisions are made when defining the feeding program of your farm. We may lose sight of the whole picture when looking only at the individual pieces. Be aware that cheap forages might not necessarily translate into higher income over feed costs or better cash flows. Therefore, an adequate balance between costs, nutritional composition, and availability of ingredients is always necessary when deciding on your feeding program. • GONZALO FERREIRA The author is assistant professor, department of dairy science, Virginia Tech. GROWING A STRONG STAND DEPENDS ON THE SEED IT’S GROWN FROM. We put more into our seed because you demand more out of it. HarvXtra™ Alfalfa is first in its category of genetically enhanced alfalfa technology. It’s designed to maximize quality versus traditional alfalfa at the same maturity stage through lignin reduction in the plant. Do not export Genuity ® Roundup Ready ® Alfalfa seed or crop, including hay or hay products, to China pending import approval. In addition, due to the unique cropping practices do not plant Genuity ® Roundup Ready ® Alfalfa in Imperial County, California, pending import approvals and until Monsanto grants express permission for such planting. ©2016 Forage Genetics International, LLC. Genuity ® Roundup Ready ® Alfalfa seed is available for sale and distribution by authorized Seed Companies or their dealers for use in the United States only. This seed may not be planted outside of the United States, or for the production of seed, or sprouts. Monsanto Company is a member of Excellence Through Stewardship® (ETS). Monsanto products are commercialized in accordance with ETS Product Launch Stewardship Guidance, and in compliance with Monsanto’s Policy for Commercialization of Biotechnology-Derived Plant Products in Commodity Crops. This product has been approved for import into key export markets with functioning regulatory systems. Any crop or material produced from this product can only be exported to, or used, processed or sold in countries where all necessary regulatory approvals have been granted. Do not export Genuity ® Roundup Ready ® alfalfa seed or crop, including hay or hay products, to China pending import approval. It is a violation of national and international law to move material containing biotech traits across boundaries into nations where import is not permitted. Growers should talk to their grain handler or product purchaser to confirm their buying position for this product. Excellence Through Stewardship® is a registered trademark of Biotechnology Industry Organization. For the 2016 growing season, HarvXtra™ Alfalfa with Roundup Ready ® Technology is available for planting in a limited geography and growers must direct any product produced from HarvXtra™ Alfalfa with Roundup Ready ® Technology seed or crops (including hay and hay products) only to U.S. domestic use. ALWAYS READ AND FOLLOW PESTICIDE LABEL DIRECTIONS. Roundup Ready ® crops contain genes that confer tolerance to glyphosate. Glyphosate agricultural herbicides will kill crops that are not tolerant to glyphosate. HarvXtra™ is a trademark of Forage Genetics International, LLC. HarvXtra™ Alfalfa with Roundup Ready ® Technology is enabled with technology from The Samuel Roberts Noble Foundation, Inc. Genuity Design ®, Genuity Icons, Genuity ®, Roundup Ready ® are trademarks of Monsanto Technology LLC. © 2016 W-L Research. Winecup Gamble Ranch has 1,500 acres of pivot-irrigated fields and another 500 acres under wheel and flood irrigation. Only 7 inches of precipitation is received annually. he considers the whole system in every decision he makes. Bale grazing To expedite natural processes while staying profitable, Gentert said he likes JESSE BUSSARD The author is a freelance writer from Bozeman, Mont., and has her own communications business, Cowpunch Creative. Arlen Gentert checks the seed depth while no-till planting a mix of forage cover crops. The practice is just one way the ranch is trying to build back lost organic matter. to try out new strategies on a smaller scale before going bigger. Among the first of his experiments to help improve soil health on the ranch’s irrigated fields was bale grazing. “During the times when we need to feed hay, like late fall or winter, we try to bale graze and feed the hay out on the fields,” Gentert said. “It’s basically our fertilizer program since we don’t use synthetics.” Gentert has tried this feeding method out on both irrigated and dry land fields. Bales are placed and fed in a way that allows the cattle to rotate around a field, spreading the manure and hay waste evenly across the area, he explained. had to first knock back the existing alfalfa stand. In the past, he has tried various methods, such as grazing an area hard before planting. However, he has found, in most cases, an herbicide burndown is the easiest, most effective option to get a field ready for planting in his conditions. While he tries not to use herbicides, Gentert recognizes sometimes it’s the only option that works. by Mary Drewnoski The quality of an oats-brassica mix stays high through early winter despite multiple frosts and freezes. Consider oats, brassicas after corn silage high-quality fall forage for grazing fallweaned calves. If fall forage is the goal, then winter sensitive species like oats and brassica are good options because they will produce more fall forage than cereal rye. In most of the Midwest these species will winterkill, which can be viewed as good (no spring management needed) or bad (no early spring biomass production), depending on your point of view. With a modest seed cost relative to yield, brassicas tend to be a low-cost source of forage; but they canâ&#x20AC;&#x2122;t be grazed in a monoculture because they are too low in fiber and too high in sulfur. MARY DREWNOSKI The author is a beef systems specialist, University of Nebraska. GET HIGHER QUALITY ALFALFA. DON’T SACRIFICE YIELD. “Our hybrids are the highest-yielding in the industry and the best choice for farmers today. The proof is in the percentages. HybriForce-3400 shines in our on-farm HAY Plot testing with a 9% yield advantage—13% versus Roundup Ready®—and 3.6% lower lignin. We’re not afraid to go on-farm to prove our performance, and our 982 head-to-head comparisons show it. *” Chad Staudinger Forage Product Manager SEE HOW HYBRIFORCE-3400 THRIVES ON YOUR FARM. CONTACT YOUR LOCAL DAIRYLAND SEED REP TODAY. tolerant. When they produce lactic acid from water-soluble carbohydrates (sugars) in the forage, they inhibit or destroy their nonacid-tolerant competitors through chemical warfare. Ditto for hydrogen peroxide. Bacteriocins are specialized chemicals that kill pathogens or other closely related bacteria, Lactobacillus cousins if you will, by punching holes in their cell walls. In nature, nothing goes to waste. The bodies of the destroyed are consumed by the surviving LABs. They have their lunch eaten by the LABs, and they are lunch for the LABs. Protein a problem they have lost DNA in their genomes, so they are smaller and can divide more quickly. They manage to outpace other bacteria, molds, or yeasts that have larger, unwieldy genomes. LABs are lean and mean growing machines. When you chop alfalfa, corn, or grasses, the LABs quickly transport plant nutrients into their own cells, which spur growth. Other microorganisms make their nutrients from scratch or have slower transport systems. Because LABs can grab the nutrients more efficiently, they leave the starvation state sooner. This means the LABs have a shorter lag time transitioning from maintenance to growth, which allows them to rapidly double and grow exponentially. The competitors such as Clostridia, Enterococcus, yeasts, and molds are left in the dust and literally have their lunch eaten by LABs. Adequate chopping of forage releases sugars, proteins, water, and other nutrients needed for LAB growth. Furthermore, fungi or molds require oxygen to grow. LABs can grow in oxygen, but most prefer to grow without it. The sooner the forage grower can eliminate oxygen, the sooner the LABs can dominate their undesirable competitors. JANE CALDWELL The author is the director of research and development for TransAgra International, Storm Lake, Iowa. NOW: EVEN MORE FLEXIBILITY Unlock profit potential beyond what conventional breeding techniques have provided. HarvXtra™ Alfalfa is the first genetically enhanced alfalfa developed to reduce the amount of lignin and maximize quality versus conventional alfalfa at the same stage of maturity. An alfalfa that gives you options, not limits. challenges of every field. That’s why NEXGROW® alfalfa offers a full line of conventional, Genuity® Roundup Ready® and HarvXtra™ seeds, to give you the flexibility to unlock the profit potential of each and every acre. To find out more about the traits and technologies that work best for your field conditions, contact a NEXGROW® alfalfa dealer or visit PlantNEXGROW.com. ALFALFA IS ALL WE DO. ©2016 Forage Genetics International, LLC. Genuity® Roundup Ready® Alfalfa seed is available for sale and distribution by authorized Seed Companies or their dealers for use in the United States only. This seed may not be planted outside of the United States, or for the production of seed, or sprouts. Monsanto Company is a member of Excellence Through Stewardship® (ETS). Monsanto products are commercialized in accordance with ETS Product Launch Stewardship Guidance, and in compliance with Monsanto’s Policy for Commercialization of Biotechnology-Derived Plant Products in Commodity Crops. This product has been approved for import into key export markets with functioning regulatory systems. Any crop or material produced from this product can only be exported to, or used, processed or sold in countries where all necessary regulatory approvals have been granted. Do not export Genuity® Roundup Ready® alfalfa seed or crop, including hay or hay products, to China pending import approval. It is a violation of national and international law to move material containing biotech traits across boundaries into nations where import is not permitted. Growers should talk to their grain handler or product purchaser to confirm their buying position for this product. Excellence Through Stewardship® is a registered trademark of Biotechnology Industry Organization. For the 2016 growing season, HarvXtra™ Alfalfa with Roundup Ready® Technology is available for planting in a limited geography and growers must direct any product produced from HarvXtra™ Alfalfa with Roundup Ready® Technology seed or crops (including hay and hay products) only to US domestic use. It is a violation of national and international law to move material containing biotech traits across boundaries into nations where import is not permitted. Growers should talk to their product purchaser to confirm their buying position for this product. ALWAYS READ AND FOLLOW PESTICIDE LABEL DIRECTIONS. Roundup Ready® crops contain genes that confer tolerance to glyphosate. Glyphosate agricultural herbicides will kill crops that are not tolerant to glyphosate. Roundup®, and Roundup Ready® are registered trademarks of Monsanto Technology LLC. HarvXtra™ is a trademark and NEXGROW® is a registered trademark of Forage Genetics International, LLC. HarvXtra™ Alfalfa with Roundup Ready® Technology is enabled with Technology from The Samuel Roberts Noble Foundation, Inc. * Because of factors outside of Forage Generics International, LLC’s control, such as weather, applicator factors, etc., results to be obtained, including but not limited to yields, financial performance, or profits, cannot be predicted or guaranteed by FGI. Actual results may vary. winter rye silage. The ration powers a 30,000-pound herd average. The winter rye is no-tilled around mid-September into corn silage stubble at a fairly hefty rate — 4 bushels per acre. Like Brubakers, Benner plants a couple of different varieties to spread his harvest window and capture as much of the forage in the boot stage as possible. “We source our normal rye seed out of Canada but then buy an early variety locally,” Benner said. Benner applies liquid manure to some fields, while others receive about 30 pounds of nitrogen in the spring. He shoots for a harvest moisture of about 65 percent. In 2016, Yippee Farms hauled off over 3 tons of ryelage dry matter per acre from their fields. half our acres to an early maturing variety and half to one that matures on the later side,” said Mike, who heads up the field operations. “We try to cut at the boot stage and harvest at about 70 percent moisture.” The Brubaker dairy herd is fed 70 percent corn silage (dry matter basis) with the remaining 30 percent of forage being evenly split between alfalfa haylage and winter rye silage. The winter cereal is also used to feed heifers, which are raised by the Brubakers but at a different farm than the milking herd. The rye tests over 16 percent protein. Liquid manure is applied to some of the rye acres before they are planted, while other acres receive manure in March using a dragline. Harvest generally occurs in late April and corn is no-tilled into the rye stubble, usually in early to mid-May. Genuity® Roundup Ready® variety with very fast recovery for frequent cutting schedules, plus enhanced forage quality for optimal animal performance. Newest generation of alfalfa combining improved forage yield potential with top disease rating on eight pests, including Race 1 and 2 of Aphanomyces. Genuity® Roundup Ready® variety with superb quality and yield potential. Designed with a high resistance to nine yield-robbing pests, including stem nematode. HarvXtra™ alfalfa seed with Roundup Ready® technology is the industry’s first genetically enhanced alfalfa developed to maximize quality, compared to conventional alfalfa at the same stage of maturity, by reducing the amount of lignin in the plant. To learn more, visit americasalfalfa.com or call 800.873.2532 America's Alfalfa, America's Alfalfa logo, Traffic Tested alfalfa seed and Traffic Tested logo are registered trademarks of Forage Genetics, LLC. © 2016 Forage Genetics International, LLC. Genuity® Roundup Ready® alfalfa seed is available for sale and distribution by authorized seed companies or their dealers for use in the United States only. This seed may not be planted outside of the United States, or for the production of seed or sprouts. Monsanto Company is a member of Excellence Through Stewardship® (ETS). Monsanto products are commercialized in accordance with ETS Product Launch Stewardship Guidance, and in compliance with Monsanto’s Policy for Commercialization of Biotechnology-Derived Plant Products in Commodity Crops. This product has been approved for import into key export markets with functioning regulatory systems. Any crop or material produced from this product can only be exported to, or used, processed or sold in countries where all necessary regulatory approvals have been granted. Do not export Genuity® Roundup Ready® alfalfa seed or crop, including hay or hay products, to China pending import approval. It is a violation of national and international law to move material containing biotech traits across boundaries into nations where import is not permitted. Growers should talk to their grain handler or product purchaser to confirm their buying position for this product. Excellence Through Stewardship® is a registered trademark of Biotechnology Industry Organization. For the 2016 growing season, HarvXtra™ alfalfa seed with Roundup Ready® technology is available for planting in a limited geography and growers must direct any product produced from HarvXtra™ alfalfa seed with Roundup Ready® technology seed or crops (including hay and hay products) only to US domestic use. It is a violation of national and international law to move material containing biotech traits across boundaries into nations where import is not permitted. Growers should talk to their product purchaser to confirm their buying position for this product. ALWAYS READ AND FOLLOW PESTICIDE LABEL DIRECTIONS. Roundup Ready® crops contain genes that confer tolerance to glyphosate. Glyphosate agricultural herbicides will kill crops that are not tolerant to glyphosate. Roundup®and Roundup Ready® are registered trademarks of Monsanto Technology LLC. HarvXtra™ is a trademark of Forage Genetics International, LLC. HarvXtra™ alfalfa seed with Roundup Ready® technology is enabled with technology from The Samuel Roberts Noble Foundation, Inc. * Because of factors outside of FGI’s control, such as weather, applicator factors, etc., results to be obtained, including but not limited to yields, financial performance, or profits, cannot be predicted or guaranteed by FGI. Actual results may vary. ERMENTATION is a biochemical reaction accomplished by bacteria as they consume the plant sugars and oxygen. They then convert those nutrients into acids, and once an anaerobic environment has been achieved, prevent the remaining organic material from further decay. With the ensiling of corn and hay crops, the desired fermentation end product is lactic acid. The more lactic acid produced in a silo or bunk of silage, the more stable and less prone to spoilage the plant material will be. The forage moisture level at the time of harvesting has the single largest impact on fermentation outcome. Water is the medium in which the carbohydrates (starches and sugars) feed the lactic acid producing bacteria. a ratio of about 3:1 lactic to acetic. The prolonged presence of oxygen in a fermenting pile of forage results in the continued heating and the degradation of organic matter — and the loss of dry matter. Depending on how hot a pile gets and how long that heat continues will alter the quality of protein, making it less available in the cow’s rumen. Piles that have suffered through extensive heating will have darkened or blackened forage that has lost much of its nutrition. In some cases, yeasts, which are in the fungus family, will interfere with proper fermentation when oxygen is available. Yeasts are everywhere in the environment and can produce molds, which can make the silage unpalatable. Yeasts will also convert sugar to alcohol. The alcohol, which is an organic compound containing carbon, will evaporate into the air taking the carbon with it, resulting in the uncontrollable loss of dry matter. Unfortunately, the presence of yeasts in silages can destroy dry matter no matter how well a pile has been previously fermented. Hay crops are a challenge Achieving properly fermented haylage — grass or legume — poses a special challenge. The proper moisture levels for grass and alfalfa silages are much more critical to the development of proper fermentation. Grass and alfalfa, unlike corn, have much lower levels of the starch that is needed to support rapid lactic acid production. The absence of adequate lactic acid results in a less acidic environment that enables the proliferation of clostridial bacteria that produce butyric acid. Silage high in butyric acid levels has a noticeably putrid smell and does not store well. It also will reduce feed intake and milk production. Oftentimes a clostridial fermentation in haylage is accompanied by the breakdown of proteins resulting in the production of ammonia. While ammonia is necessary for the fermentation of forage in the rumen, too much will be toxic to a cow. The presence of ammonia indicates that the protein in the hay crop is being destroyed. Know your fermentation A fermentation analysis is a diagnostic tool that will allow us to better identify possible problems in forages that may lead to dry matter intake problems. A complete fermentation analysis provides the moisture level along with the lactic, acetic, and butyric acid levels. Knowing the levels of these acids gives us a good idea of the type and degree of fermentation that has occurred. The ammonia level is another indicator of how well the silage has fermented. Forage evaluation data compiled by Cumberland Valley Analytical Services in Maugansville, Md., has shown that dry matters below 28 percent are associated with much higher levels of butyric acid as well as ammonia levels approaching 30 percent of the total available nitrogen in the forage. Target the corn silage dry matter to be around 30 to 35 percent, allowing for the optimal lactic and acetic acid profile. For hay crops, shoot for dry matter levels in the 35 to 40 percent range. Always include a silage inoculant to increase bacteria levels that will accelerate oxygen scavenging. Fermentation analysis is a tool that will assist a nutritionist or dairy farmer in evaluating if a forage has been ensiled properly. The type and degree of fermentation will affect the dry matter recovery and also provide us with valuable information as to how we formulate the rest of the feed ration around the silage. • JOHN HIBMA The author is a dairy nutritional consultant and freelance agricultural writer based out of Connecticut. is imperative for ideal starch digestion. In-season management decisions have a limited impact on fiber digestibility with the exception being cutting height. Cutting corn higher will raise the grain-to-stover ratio and energy content, but improving forage quality while meeting yield and inventory needs is a tricky decision. How can we evaluate what potential drawbacks or benefits could be associated with cutting corn at 12 or 18 inches instead of 6 inches from the soil surface? Considerable research has been published over the past 15 years, but how can these research results be interpreted practically and what do they mean for your farm? different treatments. After compiling the reported nutrition and yield measures for various cut heights into a spreadsheet, I developed simple prediction equations relating yield or nutrition parameters to cut height (equations not shown). Using the equations, I then predicted nutritive and yield results (see Table 1) for a normal 6-inch cut versus either 12or 18-inch cut corn silage. When evaluating the predicted outcomes in Table 1, as cut height was elevated, yield declined, which is logical. Yield would be predicted to decrease 0.6 and 1.3 tons per acre (as-fed) for 12- and 18-inch cut heights, respectively. These ton per acre declines would result in a reduced yield value per acre of $23 and $46, respectively, assuming $35 per ton corn silage value. Predicted results are based upon equations developed from 30 different treatment means reported by seven published articles (available upon request). ton at higher cuts has more starch, less fiber, and better fiber digestibility than conventionally cut corn (see Table 1). This is also logical but needs to be converted into milk per cow to estimate a return on investment. We can estimate dairy production returns by using the corn silage nutrition information within an NRC (2001) based milk prediction model. I used a ration evaluation tool to project the impact that high-cut corn silage has upon milk production potential for three different TMRs, each with corn silage cut at 6, 12, or 18 inches. The different silages, fed at 20 pounds (dry matter basis) as part of a 54 pounds of intake per cow in the TMR, projected to result in milk production gains of 0.67 and 1.3 pounds per cow, a value of $0.12 and $0.23 using $17.50 per hundredweight. Does the improved corn silage nutritional value off-set lower yield? Potentially, the milk value per acre in Table 1 suggests opportunity, but use the information presented in Table 1 at your own discretion and only as the basis for a discussion with your advisory team. Keep in mind also that moisture content will likely be different for highcut corn silage relative to conventional cut. Moisture drops with higher cutting because the grain represents a larger proportion of the tonnage and grain is drier than stover. The lower stalk is also higher in moisture than the upper portions. High-cut corn silage may not make sense for later-season harvested corn, where whole-plant moistures have dropped below the ideal window. The Finest in Pasture Aeration & Brush Management Relieve soil compaction & rootbound soil. Stimulate grass roots to grow down, resulting in greener, thicker grasses. JOHN GOESER The author is the director of nutrition research and innovation with Rock River Lab Inc, and adjunct assistant professor, University of Wisconsin-Madison’s Dairy Science Department. Receive nutrients by turning ground into a sponge, absorbing all rain, fertilizer or natural waste applications. Over 40 Years of Quality! Bale wrapping has grown in popularity among small and midsized dairy or beef producers. Fermentation in wrapped bales is somewhat different than in traditional chopped forages. Researchers at USDA’s Dairy Forage Research Center in Marshfield, Wis., recently evaluated the effect that wrapping time delay has on forage nutritive value. Large round bales from a second cutting of alfalfa were wrapped with seven layers of a 1 mil plastic either one, two, or three days after baling. The standard wrap was also compared to using an oxygen barrier film. Average wet bale weight in the study was 1,043 pounds, and bales were stored for 99 days. Internal bale temperature was monitored daily. Internal bale temperature rose linearly with a delay in wrapping. Average bale temperature was 95°F, 117°F, 128°F, and 147°F for zero, one, two, or three days at wrapping, respectively. Though dry matter recovery was not affected, wrapping delays impaired silage nutrient value and the spontaneous heating that occurred. The researchers noted that concentrations of acid detergent insoluble crude protein and total digestible nutrients changed the most once internal bale temperature rose above about 117°F at the time bales were wrapped. This corresponded with the 24-hour wrapping delay. The oxygen barrier wrap had no effect on silage nutritive value, though the researchers noted their standard seven layer wrapping protocol is perhaps more aggressive than many producers might use. Over the past five years, costs for maintaining a beef cow and the unit cost of weaned calf production have grown. Cow carrying costs have also risen along with mature cow size. Research conducted by University of Arkansas and the Noble Foundation was designed to test the effects of stocking rate and mature body size on cow and calf performance, cowherd efficiency, and system economics. Here were some of the results: 1. A 30 percent larger cow requires 22 percent more daily maintenance energy and will consume 22 to 28 percent more forage dry matter daily. This lowers the cow-carrying capacity of the farm or raises input costs associated with pastures, supplementation, and stored forages. 2. Stocking rate impacts individual animal performance, body weight production per unit of land area, and economic returns to the producer. 3. There were no effects of cow body weight on carrying cost or net returns; raising stocking rate lowered total expenses per cow and raised net returns. 4. A larger cow size raised calf weaning weights but did not affect total production per acre or profitability; however, weaning weight efficiency ratios were reduced. 5. Boosting stocking rate reduced cow weight and body condition at weaning. It required additional stored feed to be fed but did not affect pregnancy rates and led to a higher total calf weight weaned per acre and net returns. Evaluating studies where cattle consumed toxic tall fescue with chemicals that suppress plant growth resulted in an average weight gain response (0.37 pound per day) equal to or greater than the legume study responses. Cattle also have positively responded to anthelmintics, antimicrobial feed additives, and steroid implants. However, functional foods as a group did not improve weight gain. Weight gain was positively impacted in cattle supplemented with highly digestible fiber supplements. There was an observed 0.33-pound improved weight gain compared with studies using starch- and sugar-based supplements. Supplement feed conversion was estimated at 6:1 for highly digestible fiber supplements compared to 11:1 for starch-based supplements. The researchers noted that the idea of using multiple strategies to gain additive effect and restore lost production might have merit if the negative performance is attributed solely to the difference between a toxic and nontoxic fescue diet. High-yielding alfalfa removes 40 or more pounds of sulfur per acre per year and many soils are deficient today.1 In fact, a recent study showed that 81% of soil samples in Wisconsin tested low in sulfur.2 Apply GYPSOIL to sulfur-deficient alfalfa fields and you’ll likely see a dramatic difference in your crop by the very next cutting. Stands will be taller and leafier for more harvested tonnage and better feed quality. GYPSOIL supplies about 17% sulfur on a dry matter basis. GYPSOIL is also an excellent source of soluble calcium – about 21% on a dry matter basis – to improve soil physical structure. Calcium helps loosen tight soils and increases water infiltration by helping soil particles flocculate. Gypsum helps reduce ponding, runoff and nutrient losses. The national Natural Resources Conservation Service recently added gypsum to its list of conservation practices, with financial incentives available in some areas. For more information about GYPSOIL brand gypsum, including how to put it to work in your conservation program, visit gypsoil.com or call 866-GYPSOIL (497-7645). More vigorous, healthier plants translate to higher quality feed. GYPSOIL BLENDABLE pelleted gypsum is now available for blending with other fertilizers and variable rate application. Sulfur Deficiency in Alfalfa; Jim Camberato, Stephen Maloney, Shaun Casteel, and Keith Johnson; Purdue University Department of Agronomy; Soil Fertility Update; May 3, 2012. Soil Test Levels in North America, 2015 International Plant Nutrition Institute. Chen et al, Flue Gas Desulfurization Products as S for Alfalfa and Soybean, Agronomy Journal, Vol 97, January –February 2005. GYPSOIL™ is a division and trademark of Beneficial Reuse Management LLC. Jaylor has introduced a new line of dump wagons ranging from 975 to 1,315 cubic feet. Jaylor’s dump wagon is designed to provide years of trouble-free performance. Tandem commercial-grade cambered highway axles and brakes with oil bath hubs are standard equipment. The cylinder configuration provides exceptional stability and requires less oil volume than conventional multi-stage cylinders. The design of the up-and-over tailgate opening, with a 4-inch body taper, accounts for its ability to empty a full load quickly. Wide footprint, low-pressure tires add stability and low compaction. The low, wide box design makes it easier to load from the operator’s view in a combine or chopper. Design features such as built-in spring suspension in the tongue soften the ride over rough terrain and lessen wear on the tractor. Visit Jaylor’s website at www.jaylor.com/dumpwagon. Kasco Manufacturing is offering a new agricultural seeder in 8- or 10-foot working widths with high capacity seed hoppers. Ideal for alfalfa producers, pasture renovations, or grass seeding, these new seeders utilize Kasco’s Precision Seed Metering System for eliminating seed waste. Other features include two rows of cast-iron press wheels to ensure good seed-to-soil contact and extra leveling action; meters that adapt for a variety of seed sizes and standard agitator for consistent seed mixture. For more information, contact Kasco Manufacturing, Shelbyville, Ind., phone: 800-458-9129. Visit their website at www.kascomfg.com. able for most, popular quick-attach front loaders with a loader arm distance of 54 inches or less. Worksaver also has introduced a dual-arm bale squeeze for handling wrapped or unwrapped large rectangular bales, as well as round bales. Hydraulic cylinders open both arms to handle bales from 48 to 96 inches in length and up to 2,800 pounds. The round, tubular arms do not puncture the plastic wrap, retaining bale quality during storage. The SSBS-48D mounts to skid steer loaders and tractor front loaders that use the industry standard universal skid steer quick attach system, while the GLBS-48D is designed for tractor front loaders with the Euro/Global quick-attach system. For more information, contact Worksaver Inc., Litchfield, Ill., phone: 217-324-5973, or visit their website at www. worksaver.com. The Machine Shed column will provide an opportunity to share information with readers on new equipment to enhance hay and forage production. Contact Managing Editor Mike Rankin at mrankin@hayandforage.com. ODAYâ&#x20AC;&#x2122;S corn silage hybrids offer high yield potential but can vary substantially in nutritional quality depending on genetics and the growing environment. Dual-purpose, leafy, and brown midrib (BMR) hybrids are the three main types of corn on dairy farms producing corn silage. Dual-purpose hybrids were designed for grain or corn silage production and generally have moderate fiber digestibility with high grain potential. While 30-hour (hr) neutral detergent fiber (NDF) digestibility for dual-purpose hybrids can vary by more than 10 percentage units in different growing seasons, fiber digestibility generally varies minimally (2 to 5 percentage units) when dual-purpose hybrids are grown in the same location. Francis Glenn (Glenn Seed Ltd, Blenheim, Ontario, Canada) developed the first leafy corn hybrids in the 1980s with the idea of producing a high-quality corn silage crop to feed dairy cows. These days, Glennâ&#x20AC;&#x2122;s foundational seed lines are used by companies in the U.S., Canada, and around the world. Leafy hybrids have at least eight leaves above the ear and a lower ear placement on the stalk compared to dual-purpose. Current breeding efforts are focused on developing full floury kernel texture to boost starch availability. an organic matter basis (NDFD30om), lignin, starch, 7-hr digestible starch (starchD), and undigested NDF (uNDF) content measured after 30, 120, and 240 hours of in vitro digestion. What we found Dry matter at harvest ranged from 35 to 38 percent (see table). Starch content ranged from 34 to 36 percent with no differences among hybrids. Yield (at 35 percent DM) did not differ significantly among hybrids. StarchD on fresh chop ranged from 54 to 64 percent and was lowest for the bm1 and higher for nonBMR. There was no significant difference in starchD between bm1 and bm3. After 30 days of ensiling in vacuum bags (to mimic silo fermentation), starchD improved by more than 10 percentage units (73 to 79 percent), with no significant differences among hybrids. NDFD30 varied significantly among BMR and non-BMR, with nearly a 10 percentage unit advantage for bm3 compared to non-BMR. There was no difference on NDFD30 between bm1 and bm3. BMR lignin content (1.8 to 2.0 percent of DM) was significantly lower than non-BMR (2.5 to 2.6 percent), with no differences between bm1 and bm3. Fiber digestibility or indigestibility of corn silage affects feed intake, rate of forage particle breakdown, ruminal turnover, and milk production potential. In rations with more than 40 percent corn silage, a recent study showed that milk potential improved by nearly one-third pound per day for each 1 percentage unit bump in NDF digestibility. Fresh chop samples were used with MILK2006 to provide a relative hybrid ranking for milk potential (see table). ERIC YOUNG The author is an agronomist and soil scientist with the Miner Institute in Chazy, N.Y.
ber one in milk per acre, the non-BMR hybrids ranked second and third. quality measure. Since uNDF is a more uniform feed fraction than NDFD, it has a predictable digestibility (zero) and can be used to estimate fast and slow fiber digestion pools to fine-tune rations. The next version of the Cornell Net Carbohydrate and Protein System (CNCPS) model will have the capability to utilize uNDF time points to formulate rations. Our uNDF results supplied additional information on silage quality. For example, uNDF30 was significantly lower for the BMR hybrids and did not differ among them. However, uNDF measured at later time points (such as uNDF120 and uNDF240) showed differences between bm1 and bm3 (see figure). Bm3 had significantly lower uNDF120om compared to bm1 and nonBMR, and there was no difference in uNDF120om between bm1 and nonBMR. The bm3 hybrids also had significantly lower uNDF240om compared to bm1 and non-BMR. While lower uNDF values imply greater whole plant fiber digestibility at any given time point, rates of digestion are derived from curve fitting based on the three time points and would better capture overall fiber digestibility of the hybrids. DARF is still #1. Customer response has made the 1017 DARF hay rake a proven success. The model represents years of unmatched performance over thousands of acres plus Nikkel’s attention to detail. Find out what the competition already knows. Call today to learn more. Work faster ~ Work smarter Built Strong. Trusted for Life. Still the Most Trusted Traveling Irrigation Systems Now Offering More to the Ag Market! www.LDAGmachinery.com 866-889-3846 Baleskiis@LDAGmachinery.com Available at your local dealer. Visit our website to find one near you. HANDLES HAY & SILAGE BALES EVEN IF THEY’RE KO’D. Call today or visit us online to learn more. Find us on Facebook and view products in action on our YouTube channel! NO Explosions! NO Poison Bait! Pressurized Exhaust Rodent Controller PERC® • The most effective and safe way to control burrowing rodents. • Saves time, gopher mounds are probed, not dug out. $2.50 per word per issue. 10 word minimum. Merger attachment for John Deere R450 and W200 Series Windrowers to save passes in the field. Wider merger for your toughest conditions. New Innovative Irrigation system from K-Line Irrigation! 8A BUMPER Bumper and ballast system for John Deere 8000 Series Self-Propelled Forage Harvesters. Earlage at a whole new level for John Deere 8000 Series Self-Propelled Forage Harvesters. RCI Engineering reserves the right to make changes in design or appearance without incurring any obligations related to those changes. Images shown may not be representative of final production unit. Knoll Dr. RCI products your local For more information, visit208 us River at www.RCIengineering.com, call usareatavailable (888) through 472-4552. Mayville, WI 53050 John Deere dealer or call RCI Toll Free at 888-472-4552 Fax: 920-387-9806 RCI products are also available through your local John Deere dealer. © 2013 RCI Engineering LLC. All rights reserved. ©2015 RCI Engineering LLC. All rights reserved. Join us for this free webinar October 17 Noon–1 p.m. C.S.T. Moving and feeding round bales? Check out Worksaver’s Spin Offs! Eliminate wasted hay by only unrolling what cattle will consume in one hour. Change feeding location each day. All models are hydraulically driven. Rotates in both directions for easy feeding and features a 53” forged tapered spear for easier bale penetration. Available in three models and designed to fit Category II or Category III 3-pt. hitches, front loaders and skid steers. Visit worksaver.com to learn more. When it comes to ground preparation no one can come close to the level of dedication and experience than Northwest Tillers. With over 60 years in business and many more in collective experience the Northwest line has become something that farms have come to rely on for years on end. Available in a range of sizes from 10' to 20' the Hay & Forage unit is capable of having a seed bed ready floor in as little as one pass. All this is achieved by placing additional blades and rotors on the shaft allowing for a much finer cut; in turn resulting in a better seed bed in a fraction of the time. Call today to reduce your labor and fuel costs and enhance your ability to seed sooner. A Proven, Non-Corrosive Forage Treatment Alternative to Acid! because you don't have time for anything less. windrow turner Move dirt, level land, dig holes, The 5-wheel windrow turner is clear areas and drain or fill low designed as a multi-purpose spots with your choice of 3, 5 & 7 management tool. It will lift and yard models. turn existing windrows or one that is wet from rain or dew to speed curing time. Single & double bar mowers for every type of grass or hay cutting need, no matter what the conditions. Single bar mowers are ideal for compact tractors and can mow 20 degrees below level making mowing road ditches easier. Removes leaves, trash and pruned limbs from your pecan orchard BEFORE harvest, while leaving existing pecans on the ground. Available in 8, 10, 12, 16, 20 & 24 ft. models. 1-800-445-9202 Prove Your Hay is the Best. More maneuverable, more flexible and gets more hay into the windrow. Available with 16, 20, 22 or 24 wheels. Also available with 17, 19, 25 & 27 wheels with rubber mounted teeth. Features adjustable width & flexible frame for clean, uniform raking across uneven ground. Available with 12, 14, 16, 18 & 20 wheel lengths. • Original Features • Event Coverage • Direct to your inbox every Tuesday a.m. Participate in the Southeastern Hay Contest and showcase your high quality hay for a chance to win great prizes and recognition.
. ... .. . ... . . .. .. .. .. .. .. . . .. .
. . . .. ... .. . .. . . . . .. .... . . ..... .. .. . . .
. . . .. ... .. ... . . . . .. .... . ..... .. ... . . .
. . . .. ... .. ... . . . . .. .... . . ..... .. .. . . .
. . . . . .. ... .. ... . . . . .. .... . . ..... .. .. . . .
. . . .. . .. .. ... . . . . .. .... . . ..... .. .. . . .
. . . .. ... .. . .. . . . . .. .... . ..... .. ... . . .
. . . .. . .. .. ... . . . . .. .... . ..... .. ... . . .
. ... .. . ... . . .. .. .. .. .. .. . ... .
SMALL SQUARE BALE . ... .. . ... . . .. .. .. .. .. .. . ... .
. . . .. ... .. ... . . . . .. ... . . ..... .. . .. . . .
TH0919 S&W Hay & Forage Ad (7,5x4,875”) R3.indd 1 . 34273 210th Ave Pittsﬁeld, IL 62363 . ... .. . .. . . . .. . .. .. .. .. . . .. .
Made in the USA! GFC / God, Family, & Country . . . .. ... .. . .. . . . . .. .... . ..... .. ... . . .
www.airbarn.com 21 SMALL BALES . .
Great products. New technologies. From the folks who focus on alfalfa. When you go BiG, you save BiG. Put our best offers to work for you during DealMaker, now through December 31st. We’re packing on the savings with the BiG Pack large square baler, available in 3x3, 3x4, 4x4, and MultiBale sizes. Now is the time to buy during DealMaker. To learn more or to ﬁnd your Krone dealer, visit krone-na.com. Progressive by Nature. Safety by Design. Since 1995, dedicated volunteers and generous sponsor organizations have been getting together to support the Progressive Agriculture Safety Day® program. They’re doing their part to realize our common mission: providing education and training to make farm, ranch and rural life safer and healthier for children and their communities. It’s easy to get involved. Contact us to find out how you, your organization or your community can join the effort to make that vision a reality at 1-888-257-3529 or www.progressiveag.org. Feed & Nutrition • Forage • Animal Health • And More! Information for producers and for training employees. Combining the intricacies of dairy cow health care with the welfare protocols of the USDA organic program, author and veterinarian Paul Biagiotti details vital information for managing organic dairy animals. The book contains academic as well as experiential recommendations formed during the author’s 25 years of veterinary service. Practical Organic Dairy Farming is broken into four sections detailing (1) general information about organic dairy production, (2) herd health by age and life stage, (3) specific disease prevention and treatment, and (4) example standard operating procedures.